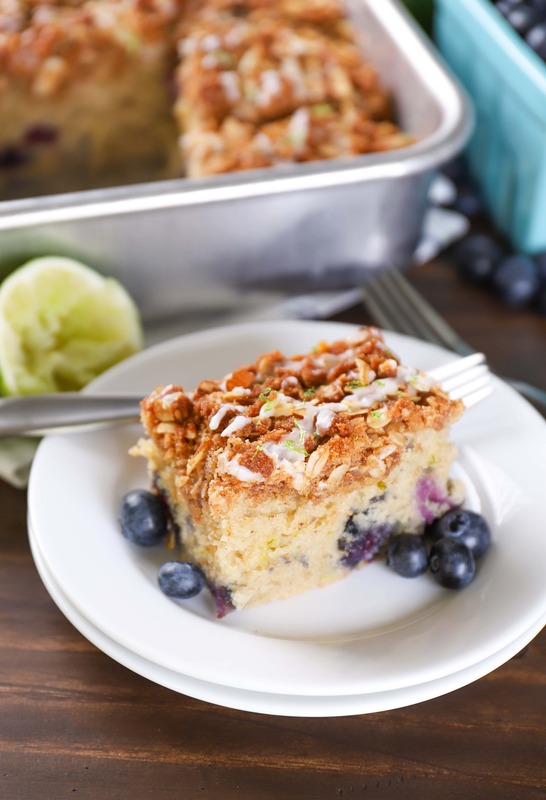 This easy Gluten Free Blueberry Lime Coffee Cake recipe is bursting with sweet blueberries and a hint of lime! A thick layer of crunchy almond streusel tops the coffee cake and makes it completely irresistible! We have half of our gardens planted with the hopes that it will stay warm enough to plant the rest of the seeds soon! I am ready for all kinds of fresh, summer produce! While it will still be a bit before we’ll be enjoying MN grown fresh berries and vegetables, I’m still eating and baking with all kinds of fresh fruits and vegetables lately, especially berries. 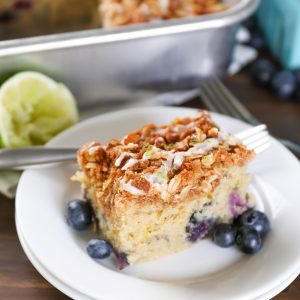 Ever since making blueberry lime crumb bars, I’ve been hooked on the blueberry lime combination. 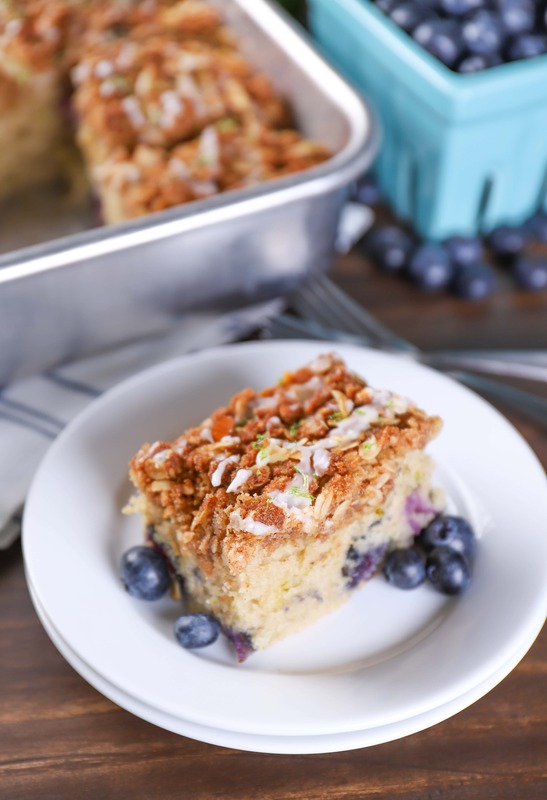 However, when I went to look for recipe on my blog the other day for a blueberry lime coffee cake that I like, I realized that I haven’t added anymore blueberry lime recipes since the crumb bars. I couldn’t let the lack of such a great flavor combination continue! While this gluten free blueberry lime coffee cake isn’t the one that I was originally looking to make when I discovered the absence of recipes, it’s worth a spot on the blog! It’s actually a twist to this gluten free blueberry lemon coffee cake that is one of the most popular coffee cakes on the blog. My husband was halfway through a slice when I told him it was gluten free. He said that he never would have guessed and that the texture was great. He also asked if there would be coffee cake left to take to work with him the next day! The main difference is obvious. I swapped out the lemon for lime. 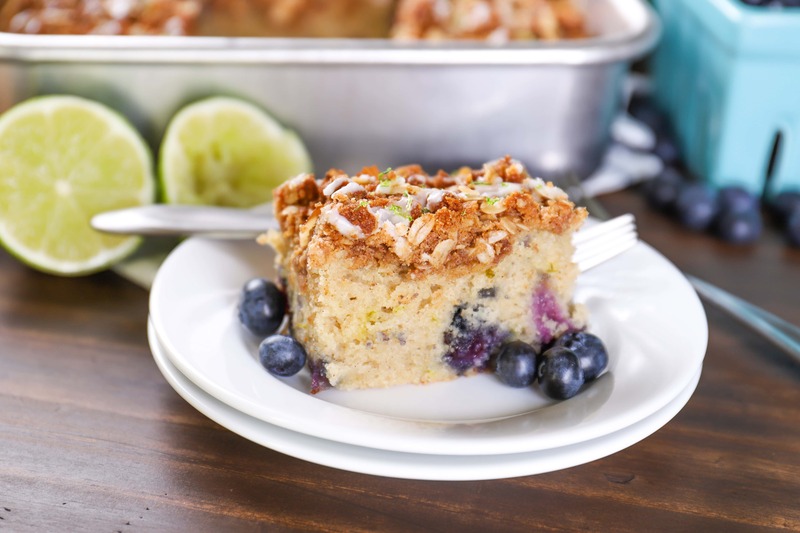 Tender and light, this coffee cake is bursting with fresh blueberries and fresh lime juice and zest. Don’t worry, the lime isn’t overpowering. It’s more of a hint of lime. I reduced the amount of fresh juice and zest to make the lime compliment the blueberries without being the main flavor. The other difference is a thicker, crunchier layer of streusel and sweet drizzle of glaze. Almost twice as much streusel is used and sliced almonds are stirred in to pair with the nuttiness of the oats and give a bit of crunch. I’m a firm believer in a good streusel topping on coffee cake. Sweet, crunchy, and lots of it. This topping is definitely good! 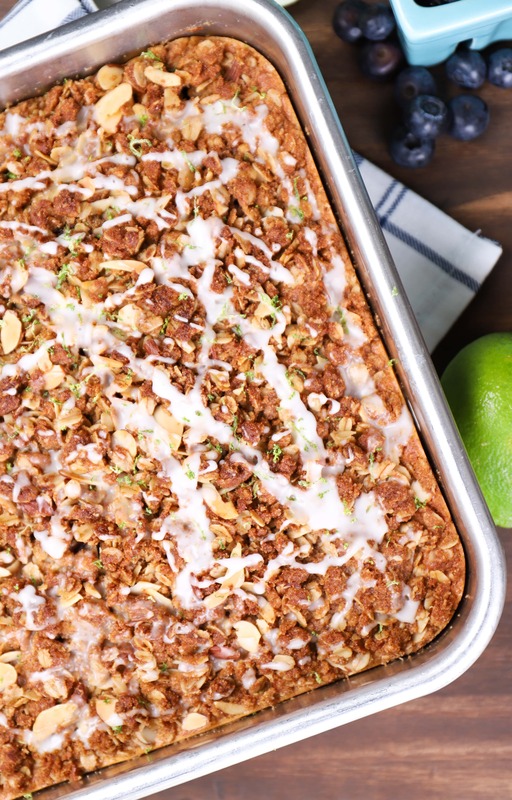 Whip up a coffee cake for your next special occasion or for this weekend’s brunch! In a large bowl, whisk together flour, almond meal, baking powder, salt, baking soda, cinnamon, and nutmeg. Set aside. In the bowl of a stand mixer (or with an electric mixer), cream together butter and sugar. Beat in eggs until creamy. Carefully beat in milk, lime juice, and vanilla extract until combined. Stir together oats, almond meal, brown sugar, cinnamon and salt. Cut in butter until mixture resembles coarse crumbs. Stir in sliced almonds. Sprinkle over the top of batter. Bake for 40-50 minutes, or until toothpick inserted in the center comes out clean. Remove to a wire rack to cool. While cake is cooling, prepare glaze. Stir together confectioner's sugar and lime juice until smooth. Drizzle over the top of the cake. Allow glaze to harden before serving. Serve with additional lime zest, if desired. Simple, but it is a very delicious recipe.